WASHINGTON -- Tom Donohue, the president and CEO of the U.S. Chamber of Commerce, made a record $4.7 million last year, at a time when the rest of the country was seeing high unemployment and falling wages. Donohue's pay package included a $3.6 million bonus. His compensation in 2010 was $1 million higher than it was in 2009, when he was the sixth-highest paid lobbyist in the country. 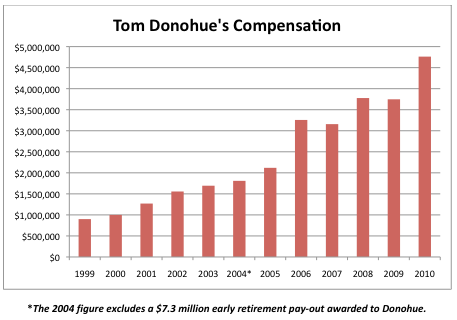 In March, Donohue made headlines for saying that the compensation of public workers is "over bloated" and their pensions are "out of control." Donohue's compensation was revealed in the Chamber's 990 tax forms, which became publicly available this week. The Chamber itself also did quite well in 2010, collecting a significant number of million-dollar donations. According to information compiled by the group U.S. Chamber Watch, the business lobby received at least $189 million in dues from 1,511 members, including corporations, individuals and organizations. Eighty-eight percent of those donations were for $100,000 or more, and 53 percent of the members donated $1 million or more. The Chamber also received two contributions that were each in excess of $10 million. On its website, the Chamber boasts that it represents "3 million businesses of all sizes, sectors and regions," more than 96 percent of which are "small businesses with 100 employees or fewer." A significant amount of its funding, however, appears to come from a relatively small number of entities. "The U.S. Chamber is an organization that's made up of the one percent, to advocate for the one percent, said Christy Setzer, spokeswoman for Chamber Watch. "That's reflected in every aspect of the Chamber's operations, from the nearly $5 million compensation package received by their president, Tom Donohue, to the policies for the wealthy that they've taken their biggest stances on -- including their support for extending the Bush tax cuts and a tax 'holiday' on overseas profits. That may be cool comfort to big corporate CEOs, but hardly helpful to struggling Mom and Pop shops across America." The Chamber did not return a request for comment.